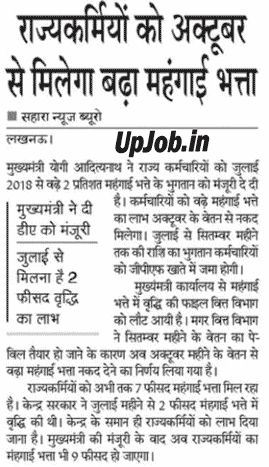 State government of uttar pradesh very soon going to give festival bonus for their employee. Approximately more then lakh government e employee and teachers will be benefited under the bonus scheme . Only non gazette employee will get benefit of this bonus . Its expected that bonus will be delivered in the beneficiary account after the dussehra festival finance department of uttar pradesh now started the process of distributing Bonus. Senior office of finance department said its expected that bonus will be credited after Dussehra festival . Central government recently order to give 30 day basis salary to their employee for 2014-15 . After releasing the order by central government now state government will very soon publish the GO regarding this concern . Maximum limit of bonus will be 3500 .this bonus is given for 30 day so its expected that bonus will be approximately 3450. Half amount of bonus will be credit in GPF.